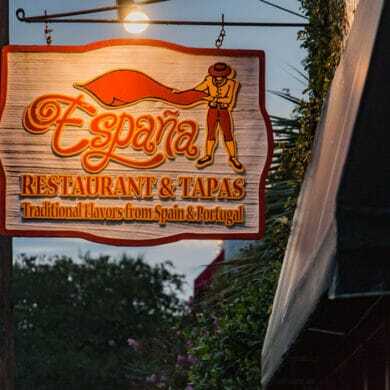 When you say the word “España” to Amelia Island locals, their eyes will usually light up and they will look for a place to sit down until they regain their composure–yeah, it’s that good. In 2004, Roberto Pestana and his wife, Marina, opened España. Since then, the love affair between the locals and España has been something special. It all starts with España’s lovely, intimate atmosphere. The indoor dining room is cozy and perfect for a date night. There is a small bar area with a beautifully tiled backsplash full of vibrant colors that make you feel like you’re in…España–nice guess! On nice evenings, there is seating available outside that overlooks the magnificent garden. Even though the sign outside says “España,” the food being served is a fusion of Spanish, Portuguese, and Brazilian cuisine. Start off small with some authentic tapas. These small sample size dishes, originally used to keep fruit flies out of drinks, have found their way into some of the most renowned restaurants. The Gambas con Curry, or shrimp and curry, is among the favorites at España. The fresh catch shrimp are sautéed and served with a curry sauce and bacon. The star of the show at España is certainly the paella. All paella dishes are available as a dish for one, two, or four people. The paella arrives at the table fragrant and steaming. The masterfully blended flavors of garlic, saffron, and sofrito make each bite an experience to remember. Mandy, a server for 10 years at España, recommended another dish for the serious seafood connoisseurs. Let the flavors of the Iberian Peninsula come to you at España in Amelia Island. And because of the exclusivity and popularity of España, we highly recommend calling ahead for a reservation. España is located at 22 S 4th St, Fernandina Beach, FL 32034. For more information or to look at a menu, visit the España website or call (904) 261-7700.